Charleston native William Moultrie (1730–1805) was a commissioned colonel of the 2nd South Carolina Regiment who led the defense of the small fort on Sullivan's Island (later named Fort Moultrie in his honor). 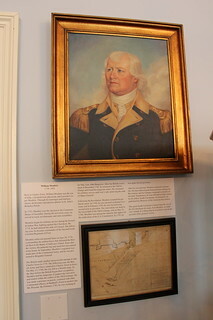 As a result, he was promoted to brigadier general and his regiment was taken into the Continental Army. Captured in the fall of Charleston to the British in 1780, he was later and promoted to major general in 1782, the last man appointed to that rank by Congress. After the war he served as the 35th Governor of South Carolina from 1785–87 and again from 1792–94.